Product prices and availability are accurate as of 2019-04-12 04:52:43 EDT and are subject to change. Any price and availability information displayed on http://www.amazon.com/ at the time of purchase will apply to the purchase of this product. 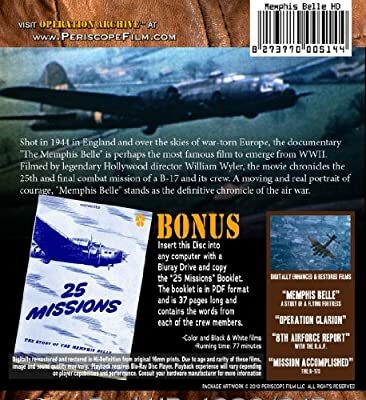 Shot in 1943,The Memphis Belle is the most famous documentary to emerge from WWII. Created by legendary Hollywood director William Wyler, the movie chronicles the 25th and final combat mission of a B-17 crew. A moving and real portrait of courage, it was personally endorsed by President Franklin Roosevelt, and shown in theaters throughout the United States on his order. Despite dramatizations like Twelve O'Clock High and the Matthew Modine starrer Memphis Belle, the original documentary is unparalleled. It's simply the most definitive chronicle of the air war in Europe as it was fought by American bomber crews. 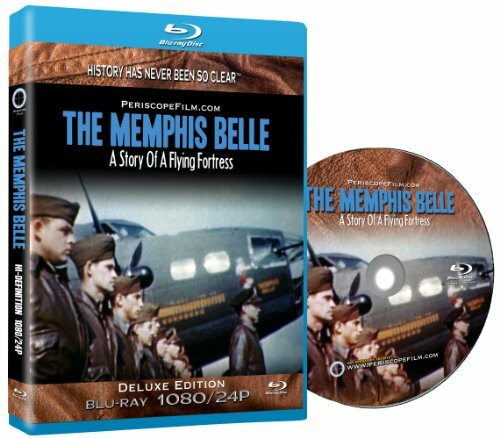 Featured on this BluRay disc is a new, digitally enhanced transfer of The Memphis Belle in its entirety. Unlike previous versions of the film on VHS and DVD, the BluRay format provides incredible detail -- you can literally count the rivets on the B-17. Also included are additional rare, authentic 8th Air Force films made during WWII. These include Operation Clarion, a confidential account of a bombing campaign, and two propaganda films: the 8th Air Force Report from Britain newsreel which includes a war bonds plea from General Eisenhower, and Mission Accomplished which was shown to defense plant workers. 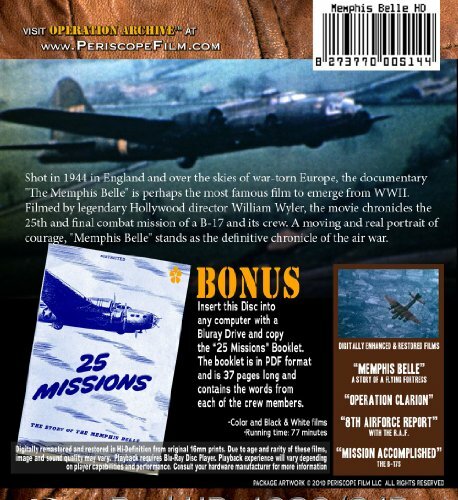 As a special bonus, a PDF file of 25 Missions, an original War Department pamphlet about the Memphie Belle and her crew is included on the BluRay. A computer with a BluRay drive is required to access this feature. Color and black and white, sound films. Run time: 77 minutes.